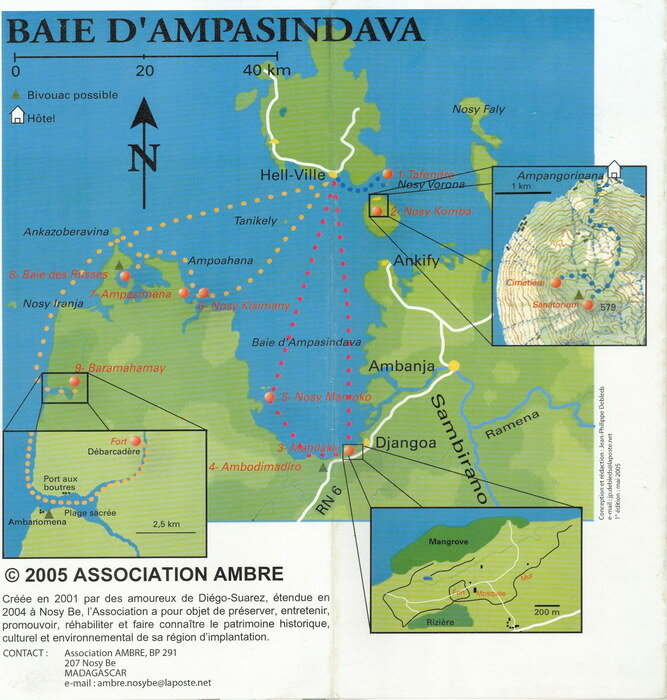 This colour leaflet is the third in a series of tour routes in the Nosy Be area published by the Association Ambre. This one guides tourists on three boat tours between Nosy Be abd the mainland. The routes are indicated on a map and the text gives a running commentary on the important sights encountered en route. Several photographs illustrate the sights mentioned. Créée en 2001 par des amoureux de Diégo-Suarez, étendue en 2004 à Nosy Be, l'Association a pour objet de préserver, entretenir, promouvoir, réhabiliter et faire connaître le patrimoine historique, culturel et environnemental de sa région d'implantation. Created in 2001 by lovers of Diégo-Suarez, and extended to Nosy Be in 2004, the Association aims to preserve, maintain, promote, rehabilitate and make known the historical, cultural and environmental heritage of the region in which it is established.